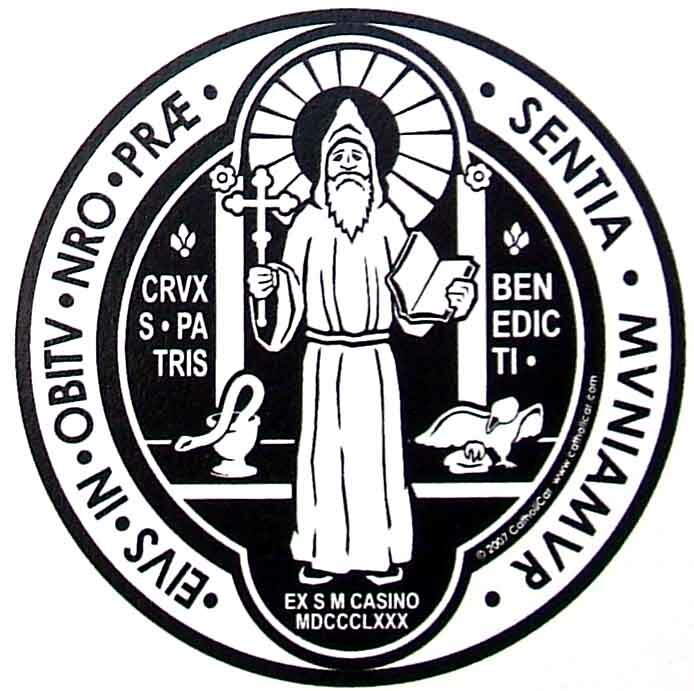 Known as the “Father of Western Monastic Life,” Saint Benedict is the founder of the Benedictines. Born in 480 into a noble family in the village of Nursia, Italy, he studied in Rome but, fearing he would succumb to the licentious life of his peers, left it all behind in 500 to embrace the monastic life. He retreated to the deserted mountain area of Subiaco where, guided by the Holy Ghost, he took up residence in a deep and remote cave. There he remained for three years many times depending on God’s providence for food as crows would bring him bread. The only human contact he had for three years was with the holy monk Romanus who brought him food, water and simple clothing. Despite his solitude, the fame of his holiness spread far and wide, drawing many disciples to Subiaco. To minister to them Benedict founded a colony of monks and, with their help, built 12 monasteries at Subiaco. He also summoned his blood sister Saint Scholastica to help and she established numerous monasteries for nuns there to accommodate the women who wished to follow Benedict. The strictness of this holy abbot’s rule and the vice of jealousy played a role in rebellion by some monks who conspired to poison Benedict. One of the conspirators mixed poison into Benedict’s drink bowl. As was his custom, Benedict always blessed anything before he ate it. As he made the sign of the cross over the bowl it broke into pieces and the poison spilled harmlessly into the wood. Those monks who had planned this dastardly deed repented, seeing the hand of God in the event. Shortly after, Benedict moved south to Montecassino where he founded the great abbey there which stood until World War II. There also he composed the bible of monastic life – the “Rule of St. Benedict” which has become the standard legislation for monastic life for religious men and women in the western world. Benedict held the personal love of Christ paramount for all with an emphasis on humility and prudence. His motto was Ora et labora, “Pray and work” with the insignia of a cross and a plough. He was renowned for many, many miracles and knew six days before that he was going to die. On March 21, 543 he asked his fellow monks to carry him to the abbey sanctuary where, after having received the Body and Blood of Christ in Holy Communion, held his arms high toward Heaven and calmly left this earth with a prayer on his lips. May the intercession of the blessed abbot Benedict, commend us, we beseech Thee, O Lord, that what we cannot attain by our own deserts we may attain through his patronage. Through our Lord Jesus Christ, Thy Son, Who liveth and reigneth with Thee in the unity of the Holy Ghost, God, World without end. R.Amen. Lesson from the Book of Wisdom. He was beloved of God and men, whose memory is in benediction; He made him like the saints in glory, and magnified him in the fear of his enemies; and with his words he made prodigies to cease; He glorified him in the sight of kings, and gave him commandments in the sight of his people, and showed him his glory; He sanctified him in his faith and meekness, and chose him out of all flesh; for He heard him and his voice, and brought him into a cloud; and He gave him commandments before his face, and a law of life and instruction. Lord, Thou hast prevented him with blessings of sweetness; Thou hast set on his head a crown of precious stones. V. He asked life of Thee, and Thou hast given him length of days for ever and ever. Blessed is the man that endureth temptation, for when he hath he hath been proved, he shall receive the crown of life. Thou hast given him his heart’s desire, O Lord, and hast not withholden from him the will of his lips; Thou hast set on his head a crown of precious stones. May the holy Abbot, Benedict, we beseech Thee, O Lord, pray that the sacrifices laid upon the sacred altars may avail for our salvation. Through Our Lord Jesus Christ Thy Son, Who liveth and reigneth with Thee in the unity of the Holy Ghost, one God Forever and ever. R.Amen. A faithful and wise steward, whom the Lord hath set over His family; to give them their measure of wheat in due season. Together with the reception of Thy sacrament, O Lord, may the blessed abbot Benedict, protect us by interceding for us, that we may put into practice the virtues of his life and partake of the power of his intercession. Through our Lord Jesus Christ, Who livest and reignest, with God the Father, in the unity of the Holy Ghost, one God World without end.